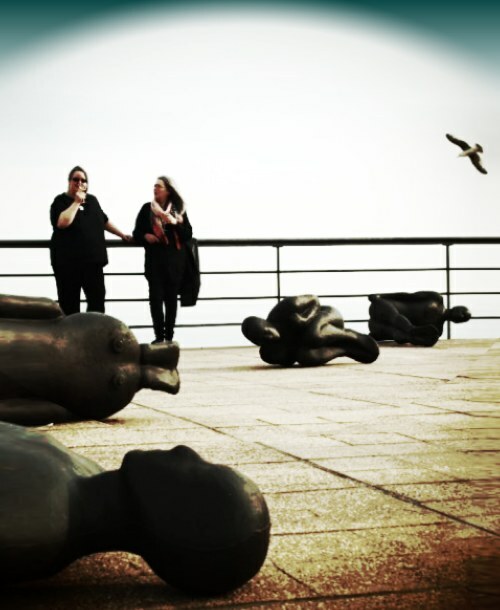 Went to visit an exhibition of 60 cast-iron life size replicas of Antony Gormley at the De La Warr Pavilion. Antony Gormley being responsible for The Angel of the North. Some photos were taken and one inspired me to do a little post processing in photoshop. Well ok so I don't actually have photoshop. I use a program called Xara which is much more fun (to me). The seagull in the corner was actually really there, and it amused me as I was once in a band called The Suicidal Seagulls. Anyway, Nicola and I look much like those guys on the roof but we don't paint like they do! Here is People In Black, featuring SFX and Nicola Quinn, original photo taken by Sophie Quinn.